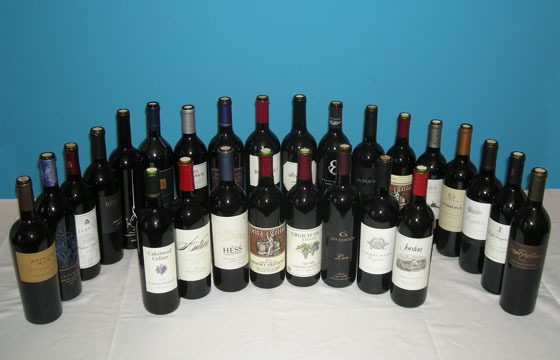 The Fifty Best held a “blind” tasting of 25 recent release California cabernet sauvignon wines priced at $50 and over, with 18 pre-qualified wine judges. Strict tasting rules were applied. The order of service was established beforehand by lottery. Each of the wines were poured into fresh glasses from new sealed bottles and served well chilled. Only ice water and white bread were available to cleanse the palate. This limited production wine (1,000 cases) was produced from grapes grown on a volcanic ridge high above Napa Valley. Aroma: Cherry, cassis, black plum, ripe blackberry, bright raspberry, rose, white pepper, vanilla, licorice, chocolate, tea, mineral, brine, tobacco, leather, forest floor, earth, smoke, lush, elegant. Palate: Bing cherry, black fruit, plum, cranberry, blackberry, blueberry, raspberry, fruit forward, black pepper, green pepper, wood spice, vanilla, mint, leather, roasted coffee, chocolate, cedar forest, mulberry, oak, zesty acidity, silky tannins, luscious. Finish: Bright red berry, raspberry, blackberry, bell pepper, complex minerals, medium tannins, complex, juicy, flavorful, creamy, velvety, very smooth, elegant, balanced, should develop nicely. This wine was made from a blend (88% Cabernet Sauvignon, 5% Merlot, 4% Cabernet Franc and 3% Malbec) grown atop Mt. Veeder on the western flank of Napa Valley. Following fermentation using native yeast the wine was aged for 19 months in French oak (81% new). Aroma: Cherry, bing cherry, black cherry, dark cherry, dark plum, blueberry, black currant, blackberry, floral, cinnamon candy, vanilla, incense, forest floor, mineral, toasted oak, earth, smoke, classic cab, great typicity. Palate: Bright cherry, dark cherry, black cherry, black currant, blackberry, blueberry, cassis, black plum, raspberry, eucalyptus, vanilla, pepper, baking spice, dark chocolate, roasted coffee, toasted oak, sweet oak, medium tannins, mellow, simple, developed, rich, full mouthfeel. Finish: Spicy, pepper, cocoa, dusty, fruity, tart, nice smooth round tannins, easy to drink, round, elegant, needs time, silky, soft, smooth. The grapes for this blend of Cabernet Sauvignon and Malbec come from the Veeder Hills Vineyard, known for diverse soils and a cool growing season. Following fermentation the wine was aged for 20 months in French oak (80% new). Aroma: Ripe black fruit, sweet berry jam, raspberry, blackberry, currants, strawberry yogurt, bell pepper, tomato paste, hay, mushroom, licorice, thyme, mint, coffee, cola, tobacco, wet stone. Palate: Jammy blackberry, black cherry, plum, raspberry, cassis, currants, blueberry, plum, olive, dill, black pepper, toasted vanilla, mint, cocoa, tobacco, oak, smoky jam, medium tannins, juicy, nice ripeness, very complex, elegant, silky. Finish: Mint, chocolate, cocoa, oak, alluring, mellow, big, good balance, lush silky tannins, smooth, appealing, should develop nicely. This 100% Cabernet Sauvignon was produced from hand-picked and hand-sorted grapes grown in southern Napa Valley, in the Coombsville region. The grapes were fermented in 100% new French oak barrels and aged in 75% new French barrels for 24 months. Only 11 barrels were produced for this wine. Aroma: Caramel, cassis, cherry, black cherry, black plum, currant, blackberry, strawberry, rose, dark flowers, almond, cola, spicy, chocolate, Black Forest cake, mocha, coffee, oak, Port-like. Palate: Cherry, dark cherry, stewed plum, black fruit, plum, raspberry, cassis, currants, bouquet garni, black pepper, mint, coffee, chocolate, cocoa, mineral, oak, smoke, tannic, well-balanced. Finish: Mint, juicy, flavorful, good length, light elegant tannins, broad, bold. Made from 100% Cabernet Sauvignon, this wine was aged in oak for 3 years prior to bottling. The bottles are individually numbered. Aroma: Blackberry, black cherry, cranberry, strawberry, fresh raspberry, Asian plum, rosemary, black olive, tarragon, cardamom, mint, licorice, chocolate, mineral, leaves, forest floor, oak, toasted oak. Palate: Black cherry, cherry, tart blueberry, mixed berries, strawberry, blackberry, blackberry jam, boysenberry, blackcurrant, cassis, rose, tarragon, black pepper, clove, vanilla, coffee, oak, cedar, smoke, well balanced, medium tannin, sophisticated, Old World style. Finish: Smooth cherry, lush strawberry, nicely balanced, soft tannins, smooth, polished, superb, delicious, lush, elegant. Aroma: Rich black fruits, black currant, blueberry, cherry, cassis, bell pepper, slightly floral, dew, basil, mint, black pepper, clove, vanilla, coffee, dark chocolate, earthy, forest underbrush, cedar box. Palate: Forest fruit, black plum, black cherry, blackberry, blueberry, blueberry crème brulèe, tart raspberry, ripe plum, cassis, bell pepper, black olive, mushroom, vanilla, dark chocolate, oak, well-balanced, soft tannins. Finish: Blackberry, mild pepper, bell pepper, leather, oak, medium tannins, sweet tannins, simple, soft, moderate, clean, mouth-coating, flavorful, pleasant, elegant, rich, nice balance, should develop nicely. Grapes for this 100% Cabernet Sauvignon hail from two separate vineyards – one on Howell Mountain (yielding small, concentrated berry clusters with very thick skin), and the other on the Napa Valley floor in the St. Helena appellation. Following fermentation, the wine was aged for 26 months in French oak (80% new). Aroma: Ripe dark fruit, cassis, blueberry bomb, black currant, black fruit, black cherry, cherry, raspberry, plum, red plum, over-ripe berries, mint, tea, vanilla, tobacco, musky. Palate: Cherry, strawberry, blueberry, black fruit, black plum, blackberry, cassis, currant, herbal, tea, spicy, mocha, tobacco, leather, tart, toasted, bold. Finish: Bright cherry, juicy, needs age, lingering fruit, smooth, fairly straightforward, slightly tannic, excellent balance. Grapes for this 100% Cabernet Sauvignon were sourced from a vineyard 950 feet above sea level featuring gravelly loam soil. The wine was aged for 15 months in new French oak barrels following fermentation. Aroma: Fig, strawberry, ripe berry, currant, roast coffee, café-au-lait, black olive, bell pepper, herbal, vanilla, cola, dark chocolate, mineral, wet rocks, earth, smoke, musty, great complexity, elegant, slightly tight. Palate: Ripe earthy blackberry, cassis, boysenberry, blueberry jam, dark currant, cranberry, black plum, red plum, cherry, hazelnut, raspberry coulis, vanilla, spice, mineral, musty, good acidity, silky, complex. Finish: Bitter chocolate, salt air, light tannins, good, flavorful, smooth and polished, velvety, pleasant. Grapes for this wine (95% Cabernet Sauvignon, 3% Cabernet Franc and 2% Petit Verdot) hailed from a 9 acre vineyard located on the eastern edge of Napa at the very top of Soda Canyon Road. Aroma: Bramble berry, blackberry, black currant jam, cassis, currant, strawberry, plum, berry, cherry, green pepper, wet oak leaf, rose, jasmine, mint, spice, black pepper, dark chocolate, cedar. Palate: Forest fruit, stewed plum, black fruit, black currant jam, black plum skins, blueberry, raspberry, blackberry, white peach, lavender, mint, pepper, spice, vanilla, licorice, mocha, chocolate, leather, tobacco, oak, mouthwatering, great structure and complexity, big, firm. Finish: Black fruit, cocoa, leather, complex oak, moderate tannins, medium body, flavorful, creamy, earthy, needs some age, slightly tart, big, luscious. Grapes for this blend (81% Cabernet Sauvignon, 12% Merlot, 4% Cabernet Franc, 3% Malbec) were sourced from cool sites in Oak Knoll and Mount Veeder. Following fermentation, the wine was aged for 22 months in 85% new “Chateau Traditional” French oak barrels. Aroma: Bright cherry, cherry syrup, dark fruit, currant, cassis, raspberry, ripe blackberry, black plum, raspberry, raisin bran, floral, rose, eucalyptus, vanilla, coffee, dark chocolate, forest floor, complex. Palate: Black cherry, blackberry, black currant, blueberry, briar fruit, dark berries, raspberry, cassis, plum, black plum, cherry jam, juicy, fruit forward, cinnamon, black pepper, olive, tobacco, oak, silky tannins, elegant. Finish: Brambly, mineral, smoke, silky tannins, elegant, smooth, flavorful, balanced, needs age. Made from grapes grown in Stagecoach and Red Barn Ranch Napa Valley vineyards, this wine was aged in 100% French oak (70% new) and bottled unfined and unfiltered. Aroma: Light raspberry, currant, somewhat subdued blackberry, blueberry, cranberry, cherry, cherry cough drop, eucalyptus, dried rose petals, violet, licorice, jalapeño, cinnamon, chocolate, mocha, tobacco, leather, pencil wood, earth, dusty, musty. Palate: Black currant, raspberry, juicy briar fruit, cassis, black plum, cherry, boysenberry, black cherry, fruity berry blast, cassis, poached pear, rosemary, licorice, vanilla, chocolate, elegant, soft smooth tannins, nice balance, great structure, almost pinot noir-like, should develop nicely. Finish: Lush berries, plum, roses, juicy, mouthwatering, musky, light oak, soft tannins, smooth, balanced, luscious. Cabernet Sauvignon grapes from a single Howell Mountain vineyard were used. Following fermentation, this wine underwent 24 months of aging in French oak. Aroma: Raspberry, blackberry, cassis, black currant, dark plum, strawberry jam, un-ripened plum, green bell pepper, eucalyptus, mint, garden flowers, licorice, vanilla, tobacco, coffee, musty, forest floor. Palate: Candy apple, unripe white peach, red berries, cassis, blueberry, blackberry, black cherry, black raspberry, currant, black plum, eucalyptus, green herbs, licorice, black pepper, vanilla, dark chocolate, sweet earth, mineral, oak, medium astringency, tannic, supple mouthfeel. Finish: Currant, black olives, pepper, coffee, chocolate, cocoa, oak, round, velvety, moderate and clean, delicate, should balance with age. This wine was made from 100% Cabernet Sauvignon grapes from 4 separate Napa Valley vineyards (Stagecoach, Red Hen, Van Z and Spring Mountain). Following basket pressing and barrel fermentation using native yeast, the wine was aged for 19 months in French oak (55% new) and bottled unfined and unfiltered. Aroma: Blackberry, cassis, blueberry, dark cherry, black cherry, strawberry, currant jam, plum, black plum, cherry, vegetal, rose, violet, dark chocolate, mineral, oak, earth, brambly, Port-like. Palate: Cherry, black cherry, blackberry, blueberry jam, currant, plum, cassis, black fruit, mint, licorice, spice, vanilla, espresso, cocoa, chocolate, smoky oak, balanced perfectly between berry and oak, ripe, tart, big California Cab. Finish: Dense molasses, tobacco, grainy, oaky, dry, elegant fruit, herbal element, coating, tart, firm tannins, silky tannins, needs time, complex, smooth, excellent balance, long and satisfying. This blend of Cabernet Sauvignon (85%), Merlot (8%), Petit Verdot (3.5%) and Cabernet Franc (3.5%) from vineyards in Yountville, Rutherford and Calistoga was aged for 21 months in French oak (60% new) prior to bottling. Aroma: Ripe fruit, maraschino cherry, dark red berries, plum, strawberry, grape, plum, cassis, currant, blackberry, cherry, green bell pepper, tomato stem, green herbs, sage, oregano, cloves, violet, chocolate, mineral, smoky. Palate: Black currant, boysenberry tart, red plum, dried cranberry, cranberry, cherry, currant, licorice, herbal, mint, cigar tobacco, spicy oak, cedar, fleshy, good acidity, tart tannins, Bordeaux-style balance. Finish: Violet, mint, slate, dry, flavorful, good length, balanced fruit, tart, tannic, young, needs time, elegant, musty, velvety, complex, earthy, perfect balance of fruit, tannins and acidity. Grapes for this 100% Cabernet Sauvignon wine hail from the legendary Beckstoffer Missouri Harpet Vineyard (first planted in the 1870’s). Following fermentation, the wine was aged for 20 months in French oak barrels (70% new). Aroma: Black currant, boysenberry, raspberry, berry, cherry, plum, cassis, black fruit, herbal, green olive, dark licorice, sweet cinnamon, chocolate, graphite, wet stone, smoke, elegant. Palate: Dark forest fruit, juicy plum, cherry, black cherry, blueberry, raspberry, berries, blackberry, black currant, strawberry, cassis, banana peel, rich creamy raspberry pie, vanilla, floral, hibiscus, violet, clove, licorice, coffee bean, leather, mineral, oak, medium tannins, mouth-watering, nicely balanced, big wine. Finish: Blackberry, mineral, tannins, toasted oak, creamy, juicy, buttery, nice ripe finish, finesse, clean, soft, very smooth, good balance, sustained fruit, age-worthy, should develop nicely. This blend of Cabernet Sauvignon (98%) and Petit Verdot (2%) was aged in 100% new French oak. Aroma: Fresh cranberry, cherry, sour cherry, bing cherry, cassis, blackcurrant jam, raspberry, ripe blackberry, black plum, toasted vanilla, slightly sweet spice, coffee, tobacco, leather, sandalwood, pencil wood, pine, oak, wood, charcoal, tar, light, elegant. Palate: Cranberry, tart cherry, dark cherry, stewed plum, black fruit, blackcurrant jam, blackcurrant, blackberry, blackberry preserve, cherry, black plum, olive, mint, eucalyptus, licorice, toast, earth, smooth, soft, firm chewy tannins, balanced tannins, medium tannins, round, tart, good acidity. Finish: Cranberry pie, cherry, mint, tobacco, earthy, smoky, clean, tart, chewy, silky, creamy, oily coating, moderate tannins, smooth, gentle, tight, needs some more bottle aging. This 100% Cabernet Sauvignon was made of grapes from a cool mountain vineyard east of the city of Napa. Following cool “cave fermentation”, it was aged in 100% new French oak barrels for 25 months and bottled unfined and unfiltered. Aroma: Ripe plum, berry jam, cherry, cassis, blackberry, currant, black currant, herbal, toasted chestnuts, south Asian spice box, nutmeg, cocoa, chocolate, coffee, dusty, leather, wet pine, mineral, cedar. Palate: Black currant, blackberry, blackberry jam, cherry, plum, cassis, blueberry, fig, violet, haricot vert, broccoli, bell pepper, herbal, vanilla, hay, mushroom, mocha, coffee, chocolate, leather, tobacco, oak, clean, complex, nicely balanced, Bordeaux style, good tannins and acidity. Finish: Blackberry jam, soft cherry, tart, flavorful, medium tannins, smooth, velvety, soft, rich, good balance, polished, should develop nicely. This 100% Cabernet Sauvignon wine was made from grapes grown on a cool, windswept La Jota Vineyard that is noted for volcanic soil, and also from W.S. Keyes Vineyard which features decomposed granite soil. Following fermentation in stainless steel tanks using native yeast, the wine was barrel aged for 20 months in French oak (89% new) and bottled unfined and unfiltered. Aroma: Black currant, boysenberry, blueberry, cherry, cassis, plum, black fruit, floral, violet, herbal, herbaceous, vanilla, chocolate, earthy, great Cabernet typicity, bright, deeply seductive. Palate: Blackberry, black currant, currant, cassis, plum, green bell pepper, eucalyptus, vanilla, tobacco, mushroom, leather, oak, woody, tart, decent acidity, nicely balanced. Finish: Green bell pepper, cocoa, beautiful elegant tannins, should develop, soft, gentle, memorable. This wine was made from 100% Cabernet Sauvignon grapes from a vineyard located on a ridge overlooking Rector Canyon and Napa Valley – 1600 feet below. Harvest took place during cool morning hours, with fermentation over 2 weeks in temperature-controlled stainless steel tanks, followed by barrel aging for 18 months in 100% new French oak. Aroma: Fresh berries, black currant, plum, blackberry, cherry, black cherry, gamay-like, dried fruit, strawberry yogurt, lavender, tobacco, roasted coffee, complex oak, cedar, earthy. Palate: Black currant, red berries, strawberry, raspberry, black cherry, white peach, almond, licorice, black pepper, roasted coffee, leather, firm tannins, balanced. Finish: Black fruit, strong pepper, mineral, oak, moderate tannins, round, decent balance, should develop nicely. Grapes for this blend (84% Cabernet Sauvignon, 6% Merlot, 6% Cabernet Franc and 4% Petit Verdot) were sourced from a number of Napa Valley vineyards, with cold-soaking and stainless steel or barrel fermenting depending on the fruit character of each lot. The component wines were aged for 6 months in French oak (54% new) and for another 12 months after blending. Aroma: Cherry candy, muted sour forest fruits, blackcurrant, cherry, black cherry, grape, berry, blackberry, red apple, bing cherry, bell pepper, spring garden, vegetal, spice, coffee, chocolate, mineral, oak, smoky, wet forest floor, slight earthiness, expressive. Palate: Blueberry, bright cherry, black fruit, blackberry, strawberry, black raspberry, raspberry, cassis, a bit herbaceous, asparagus, bell pepper, cactus, black pepper, white pepper, vanilla, mineral, cocoa, chocolate, forest floor, slight roast coffee, balanced, juicy, an everyday cab. Finish: Vanilla, mint, oak, smoky, slightly acidic, good length, smooth, big, elegant, young but has potential. This wine was produced using a blend of grapes (75% Cabernet Sauvignon, 16% Cabernet Franc, 4% Merlot, 3% Malbec and 2% Petit Verdot) harvested from multiple Napa Valley locations. Following fermentation, the wine was aged for 20 months (46% in new French oak). Aroma: Cassis, cherry, black fruit, blackberry, muted plum, jammy, herbal, dried mushroom, forest floor, California fruit with Old World undertones, vanilla, chocolate raspberry cake, milk chocolate, mocha, linzer torte, woody, oak, earthy, smoke. Palate: Plum, red plum, cherry, raspberry, red currant, cranberry, forest fruit, black fruit, blackberry, cassis, black pepper, vanilla, oak, tart, silky tannins. Finish: Black fruit, black olive, oak, juicy, smooth, mellow, soft tannins, needs to age, complex, smoky, balanced. Made from 100% Cabernet Sauvignon grapes fermented in stainless steel temperature-controlled tanks, this wine was aged in French oak (approximately 50% new) for over 18 months prior to bottling. Aroma: Bright cherry, raspberry, grape must, blackcurrant, pineapple, violet, cassis, green bell pepper, black olive, jalapeño, vegetal, green tobacco leaf, cooking spice, black pepper, white pepper, grassy, smoke, leather, oak. Palate: Raspberry jam, deep black currant, red currant, cherry, black cherry, red plum, herbaceous, bell pepper, olive, black pepper, vanilla, earthy, mineral, coffee, oak, nice acidity, soft tannins, light body, an everyday cab. Finish: Tart apricot, raspberry creampuff, leather, mineral, earthy, strong tannins, moderate and clean. silky. This wine was made from grapes grown in the Spring Mountain District. Following fermentation, it was aged for 20 months (25% in New American oak and 75% in 2 and 3-year-old French and American oak barrels). Aroma: Plum, black raspberry, blackberry, herbal, vegetal, jalapeño, green bell pepper, rosemary, vanilla, leather, mineral, smoke, barnyard, bleu cheese, powerful. Palate: Cherry, black fruit, red berries, red plum, cassis, full ripe fruit, dried leaves, olives, green bell pepper, sage, black pepper, grassy, leather, oak, smoky, complex flavors. Finish: Green bell pepper, white pepper, spice, vanilla, chocolate, woody, tart, tight, tannic, young and will age well, seductive. Grapes from Alexander Valley (85%), Mendocino County (14%) and Dry Creek Valley (1%) went into this blend (79% Cabernet Sauvignon, 17% Merlot, 3% Perit Verdot and 1% Malbec). Following 16 days of fermentation with extended skin contact, the wine was aged for 12 months in oak barrels (73% French and 27% American) and bottle aged an additional 22 months prior to release. Aroma: Ripe cherries, black cherry, mulberry, elderberry, raspberry, red currant jam, black currant jam, strawberry jam, currants, teaberry, red plum, citrus, herbal, vegetal, herbaceous, green bell pepper, asparagus, leather, soft cow’s milk cheese. Palate: Juicy currant jam, cassis, currant, red plum, cherry, herbaceous, green bell pepper, pepper, smoke, leather, oak, Old World style, lean, balanced. Finish: Peppery, vegetal, integrated tannins, soft, smooth, memorable.